ABSTRACT: "The Minimum Wage Project" was opened by CIID researchers in 2013. In Jan. 18 2014, they held a conference on the interim results. 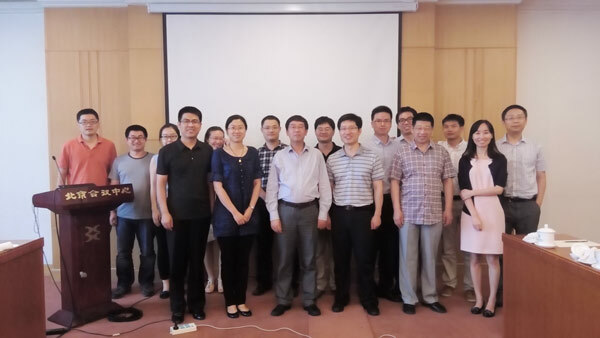 Project members reported their findings on minimum wage policy in China. 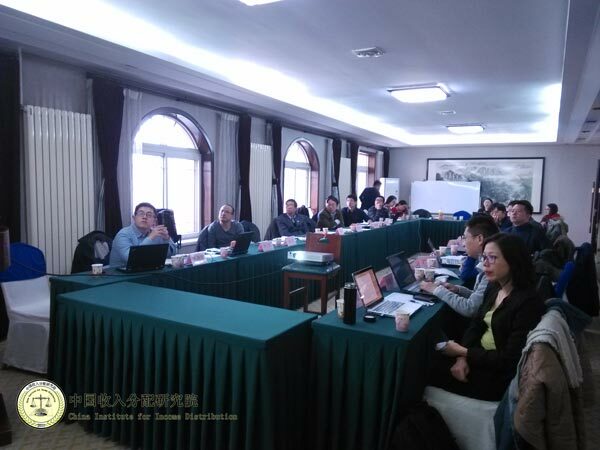 In January 18, 2014, China Institute for Income Distribution (CIID) held a conference on “The Minimum Wage Project”. The participants included Director Nie of MOHRSS; Hainan Su, the former director of the Institute for Labor and Wage Studies; Shi Li, the executive dean of CIID; Prof. Yang Du from Institute of population and labor economics of CASS, and other project members from Beijing Normal University, Renmin University, Chinese Academy of Social Sciences, Academy of Macroeconomic Economic, and Geneva Graduate Institute of International and Financial Studies in Switzerland. The topics covered the impacts of minimum wage on profits, the impacts on employment and income distribution among urban workers and migrant workers, gender differences, the implementation of minimum wage policy, and so on. Researchers also introduced the research reports of minimum wage policy in Europe countries such as France, Czech Republic, Slovakia, and Hungary. Since China promulgated new minimum wage regulations in 2004, the magnitude and frequency of changes in the minimum wage have been substantial, both over time and across jurisdictions. This paper uses county-level minimum wage panel data and a longitudinal household survey from 16 representative provinces to estimate the employment effects of minimum wage changes in China over the period of 2004 to 2009. In contrast to the mixed results of previous studies using provincial-level data, we present evidence that minimum wage changes have significant adverse effects on employment in the Eastern and Central regions of China, and result in disemployment for females, young adults, and lowskilled workers. This paper studies the impact of minimum wage policies in China on migrant workers’ income and employment. We use rural household data from 2003-2006 containing information about migrant workers’ wage income and their working days. We employ difference-in-difference (DID) method and the method of average treatment on the treated (ATT) to examine the effects of minimum wage increases in 2004 and 2005. We find that the net wage impact for migrant workers is ositive and the net impact on working days is negative after controlling for individual characteristics and provincial effects. We also examine how different income groups are affected by minimum wage adjustments. We find that minimum wage change rate has positive effect on wage increase for migrant workers whose wages are much lower than the minimum wage level, but has no significant impact on workers in other income levels. Controlling for the minimum wage effects, income inequality within migrant workers have been increased. With the continuous increasing of minimum wages in China from 474 yuan in 2004 to 1072 yuan in 2011 on average, the impact of MWs on migrant workers' wages needs to be reevaluated. Contrast to other OECD countries, the regulated MWs in China did not specify the legal working hours. Employers may extend the workers' working hours to compensate the increased costs. This paper employs a large migrant household survey and some municipal data to investigate the impact of MWs increasing on migrant workers' wages by considering the working hours. The results show MWs only have small negative impacts on migrants' employment and its impacts on rural female workers are larger than other groups. What is more, only the employment of rural migrant workers with low qualifications will be affected by MWs' increase, but not urban migrants. Without controlling working hours, MWs' increase will improve rural migrants and West migrants' wages. However, MWs' increase intensifies rural male workers' working hours, therefore it has no significant impact on migrant workers' wages after considering working hours and employment effect. This paper studies how minimum wage policies affect firm employment in China using a unique county level minimum wage data set matched to disaggregated firm survey data. We investigate both the effect of imposing a minimum wage, and the effect of the policies that tightened enforcement in 2004. We find that the average effect of minimum wage changes is modest and positive, and that there is a detectable effect after enforcement reform. Firms have heterogeneous responses to minimum wage changes which can be accounted for by differences in their wage levels and profit margins: firms with high wages or large profit margin increase employment, while those with low wages or small profit margin downsize. The increase in enforcement of China’s minimum wage in 2004 has since amplified this heterogeneity, which implies that labor regulation may reduce the monopsony rent of firms. Our results provide evidence for the theoretical predictions of the positive minimum wageemployment relationship in a monopolistic labor market. This paper empirically analyzes the impact of the Chinese minimum wage regulations on the firm decision to invest in physical and human capital. We exploit the geographical and inter-temporal variation of county-level minimum wages in a large panel data set of Chinese firms covering the introduction of the new Chinese minimum wage regulations in 2004. In our basic regressions including all Chinese firms, we find significant negative effects of the minimum wage on human capital investment rates and significant positive effects on fixed capital investment rates. When grouping firms by their ownership structure, we find that all company groups - including state-owned and foreign-owned companies - have reduced their human capital investments, while only Chinese privately owned companies have increased their fixed capital investment rates. This paper examines the impact of minimum wage policies on employment,income, and working time. Using data from China Health and Nutrition Survey, wefocus on identifying the shocks or minimum wage adjustments using a pre-specifiedmodel. We control for lagged minimum wage standard, individual characteristics,provincial economic and population variables, and provincial and time fixed effects.We find that, relative to average wage level, minimum wage level has been lower overthe years. Minimum wage has barely noticeable effect on employment, some positiveeffect on raising wages, and shortened the working hours for low-income workers. Insummary, we find some beneficial effects of the minimum wage policies. Using the China Household Income Project survey data, this paper examines the effect of minimum wage regulation on wage growth and wage distribution in China. Moreover, minimum wage's heterogeneous effects on different population groups are also investigated across different industries and ownerships. In general, our evidence empirically supports the view that the minimum wage creates a substitute effect for the low-paid workers, as they experience a small wage growth under the cost of more unemployment. Meanwhile, the wages of workers that slightly higher than the minimum pay before are pushed up by the increase in demand because of the ripple effect, so the wage level for the slightly high-paid workers before grows more than the low-paid groups. Utilizing the firm-level panel datasets and hand-collected data on county level minimum wage, this paper estimates the effect of minimum wage on firm profitability. As firms may take time to adjust in response to changes in minimum wage, this paper estimates a dynamic panel model with lagged minimum wage. To capture the heterogeneous effect of minimum wage on profitability, this paper further estimates a quantile regression dynamic panel model. Estimation results suggest that the effect of minimum wage in the current year is negative across the whole conditional distribution of profitability and it exhibits an inverted-U shape across conditional quantiles. Instead, the effect of lagged minimum wage is positive at the 5th, 10th, 15th quantiles, negative at the 90th and 95th quantiles, and not significant at other quantiles. Turning to the overall effect of minimum wage, we can find that minimum wage exerts significantly negative effect on profitability at the 5th quantile and quantiles higher than 40th and the absolute value of the effect of minimum wage increases with these quantiles. For other quantiles, the overall effect of minimum wage on profitability is negligible. The minimum wage has been regarded as an important element of public policy for reducing poverty and inequality. Increasing the minimum wage is supposed to raise earnings for millions of low-wage workers and therefore lower earnings inequality. However, there is no consensus in the existing literature from industrialized countries regarding whether increasing the minimum wage has helped lower earnings inequality. Studying the effect of the minimum wage on the earnings distribution is more complicated in developing countries such as China than in industrialized countries owing to the presence of large informal sectors in urban areas, large pools of surplus labor in rural areas, and difficulties in ensuring compliance with minimum wage legislation. China has recently exhibited rapid economic growth and widening earnings inequality. Since China promulgated new minimum wage regulations in 2004, the magnitude and frequency of changes in the minimum wage have been substantial, both over time and across jurisdictions. The growing importance of research on the relationship between the minimum wage and earnings inequality and its controversial nature have sparked heated debate in China, highlighting the importance of rigorous research to inform evidence-based policy making. We investigate the contribution of the minimum wage to the well-documented rise in earnings inequality in China over the period from 2004 to 2009 by using city-level minimum wage panel data and a representative Chinese household survey, and we find that increasing the minimum wage exerts beneficial effects on the earnings distribution—by reducing the earnings gap between the median and the bottom decile—over the analysis period. Utilizing various sources of data, this paper describes the evolution of minimum wage system in China and analyzes its enforcement. In 2010, 13% of workers in our sample earn wages below local minimum wages. This result is worse than most of developed countries but better than countries with about the same level of economic development as China. Both descriptive statistics and regression analysis indicate that some focused groups of workers ought to be targeted when implementing the minimum wages, including female and less educated workers. Our analysis further indicates that the effect of compliance in minimum wages is not only determined by the effort to enforcement, but also correlated with the level of minimum wage, economic structure, ownership type, and labor market conditions, etc. Our study also implies that the current minimum wage level in China is in accordance with China’s current stage of economic development, and frequent and large increase of minimum wage should be restrained. This paper provides evidence on whether the minimum wage (MW) has affected gender wage gaps in urban China. Several major conclusions emerge. First, from 1995 to 2007, the proportion of workers whose wages were below the regional MW level was greater for female workers than for male workers. Second, the results obtained by using the difference-in-differences estimation method show that from a long-term perspective, the MW will help to reduce gender wage differentials and that the effect is more obvious for the low-wage group. However, in the short term, the amelioration effect is not obvious. China has formulated and implemented the minimum wage policy for over two decades so far, and it is of great practical significance to look back on the formulation and evolution of the policy and assess the implementation effects to further improve the minimum wage policy and makes it fully play its role. This chapter summarizes the impacts of the minimum wage policy in China on various aspects of the labor market: wages, employment, gender and income inequalities, and regional disparities. In particular, we pay special attention to the 168 million rural-urban migrant workers in China, focusing on the wage and employment impacts they experience as a result of minimum wage policies. Our findings show that since 2004, minimum wages (nominal) in China have substantially increased, with an average of 11 percent per year, leading to positive effects on wages and decreases in gender wage differentials and income inequality. On the other hand, the rising minimum wage has resulted in job losses for young adults, women, and low-skilled workers. For migrant workers, the minimum wage has only small negative impacts on migrants’ employment in the East and Central regions and no effect in the West. In addition, our project finds that employers increase the monthly working hours of migrant workers. This implies that by offsetting the costs of a higher minimum wage by increasing the number of working hours, employers do not see the need to layoff migrant workers. This document summarizes the findings of minimum wages from many aspects in theeconomics literature and we hope it can provide a good starting point for researchers who areinterested in the minimum wage study in China.